Community members were invited to an informational meeting to learn about the current design proposal on Monday, Oct. 1. Several large construction projects are on the horizon for buildings across the Hillsboro School District. Some, like Brookwood Elementary School, can expect to see a brand new school in the coming years, but others, such as Glencoe High School in Northwest Hillsboro, are growing larger to accommodate an influx of expected students. Last November, Hillsboro-area voters approved a $408 million construction bond to make improvements at schools across the district over the next five years. On Monday, Oct. 1, community members were invited to Glencoe High School to learn about some of the proposed facility changes bound for the school, which serves students from Hillsboro, Cornelius and North Plains. All three of those cities are expected to see major growth in the coming years, said Adam Stewart, the district's capital projects officer, requiring several changes to the nearly 40-year old high school. "Because of all of the growth we have happening in the Cornelius and North Plains area, which all feed into the Glencoe/Evergreen feeder group, part of the bond was to expand capacity here at Glencoe for 400 additional students and at Evergreen to expand that capacity by 200 additional students," Stewart said Monday. 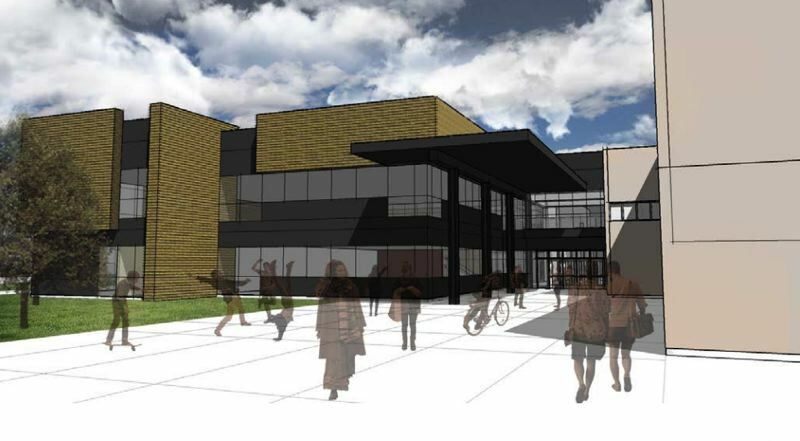 Expansion of Glencoe High and several building upgrades are projected to begin next spring, Stewart said, and will be wrapped up the following summer, in 2020. More than a dozen new classrooms will be built in a roughly 23,000-square-foot expansion. A proposal for the expansion, which has yet to be finalized, includes plans for a new counseling and career center and career-technical educational classrooms. According to the proposal, the commons area will be expanded, its media center will be relocated and cafeteria enlarged by about 600 square feet — crews plan to build an enclosed walkway between the school and the cafeteria which are currently in two separate buildings. Plans also call for a covered outdoor seating area and an additional equipment storage space. The front entrance to the school will be extended out toward the parking lot, reconstructed so that anyone entering the school will be forced to walk through the main office — which will also be reconfigured — to improve the school's security. The predominantly concrete walls of the school will boast many new windows to improve the building's natural light. The school's athletic facilities will also see improvements. Glencoe's weight room will be relocated and expanded by 3,000 additional square feet, a team room will be built as well as an outdoor covered training area. The parking lot and drop-off areas will be expanded, creating space for 111 additional vehicles and eight additional school buses. Further interior improvements include repainting, safety and seismic upgrades and roofing and HVAC upgrades. A major focus of the renovations is expanding spaces for career-technical educational programs, something that has received a major push in area schools in recent years. These changes will include renovating the current graphic design space, renovating the early childhood education space and expanding the school's student store. The school's existing health sciences classroom will be converted to a health science-specific laboratory space. These changes won't be the first in the bond for Glencoe, however. Over the summer, the school got a new multi-purpose turf sports field which will be used not only by Glencoe students, but also by youth baseball and softball teams on the Hillsboro Hops Youth Field in the southwest corner after the minor league team donated $300,000 to the project. Turf upgrades called for $2.3 million of the bond. The school's planned expansion and upgrades are projected to cost $16.1 million, with another $2.2 million for the CTE spaces. Monday's informational meeting served as a way for community members to hear about the current design proposal — which is still in the early stages — and ask questions before it goes to the city for land use approval likely next spring. The district held additional informational meetings throughout the week at other schools expecting renovations, including a meeting at Mooberry Elementary School on Thursday, Oct. 4. Project updates will be posted regularly to the bond website, hillsboro-bond.org. Quality local journalism takes time and money, which comes, in part, from paying readers. If you enjoy articles like this one, please consider supporting us. It's Spring, (no, really) Time to Shape up! This article brought to you courtesy of Nate Boyd, owner of The Gym, News-Times Inisder Fitness Expert. Fitness Frustration in February? Not at The Gym! This article brought to you courtesy fo Nate Boyd of The Gym, Forest Grove News-Times Fitenss Expert.